Home / News / News :::: Denmark’s Muslim Feminism and the First Woman Imam at Copenhagen’s Mariam Mosque. In the autumn of 2005, Jyllands-Posten published a series of cartoons about Islam’s Prophet Muhammad, including one with a stick of dynamite protruding from his turban. Among the many explanations for this controversial act was this: the deliberately provocative test was designed for Danish Muslims who - by accepting the mockery - could prove that they were assimilated Scandinavians. This crude and reckless “test” resulted in bloodshed and an economic boycott and then continuing into 2006, escalated into Denmark’s biggest foreign affairs crisis since WW II. The Muhammad cartoon test was not a good idea. When an ostensibly secular state tests its Muslim citizens by skirting the edge of insult, the result is deeper division and alienation on both sides: the racist right vs. the anti-West Islamists. In the middle – ideologically isolated from both sides - are Muslim progressives but not until 2012, was this point of view recognized in the curriculum of Danish teachers of comparative religion. Knowing that as a journalist, I had taken a minority position on the 2005-06 cartoons, a gymnasium teacher approached me, saying that she and others wanted alternative points of view from what they were getting in the mainstream press. Did I have any to share? I didn’t. Not at the time. But that soon changed. Sponsored by Democratiske Muslimer i Danmark , I traveled to England and America in 2011 to interview Muslims with progressive values and subsequently edited the interviews into Ijtihad , a video curriculum for Danish teachers of comparative religion and social studies. It was the first time many of them had ever heard of Muslim feminism. Admittedly, the idea is a relatively new phenomenon. I’ve often been confronted at dinner parties by thinly disguised Islamophobes who insist that the very concept – Muslim feminism - is an oxymoron. Failing to acknowledge the inherent sexism in Christian or Judaic patriarchy, these critics claim that Islam is a terrible religion because of its treatment of women. When you get up close to this phenomenon, however, it is clear that Muslim feminism is only a few years behind Christian and Jewish feminism. Contemporary Muslim feminist scholars hinge the eradication of Islam’s gender bias and sexism on geographical and sociological variables no longer pertinent to Protestant, Catholic or Jewish cultures. Inside Christianity, it was Catholic women who first challenged the status quo. Theologian, Rosemary Radford Ruether was one of the first, followed by other Christian scholars such as Mary Daly, Elisabeth Schussler Fiorenza and Sally McFague. Judaism was in the forefront of Second Wave feminism in America with a very long list of writers, activists and scholars such as Susan Brownmiller, Phyllis Chesler, Andrea Dworkin, Betty Friedan, Ruth Bader Ginsberg, Letty Cottin Pogrebin , Judith Plaskow and Gloria Steinem. (deeds). Other Muslim feminist scholars and activists include Nazir Afzal, Leila Ahmed, Kecia Ali, Laleh Bakhtiar, Asma Barlas, Mona Eltahawy, Tehmina, Kazi, Irshad Manji, Fatema Mernissi, Asra Nomani, Linda Sarsour, Huda Sha’arawi, Malala Yousafzai and Ani Zonneveld. Worldwide organizations that champion Muslim feminism include Musawah, Sisters in Islam, Muslims for Progressive Values, Women’s Islamic Initiative in Spirituality and Equality and British Muslims for Secular Democracy. I did not know of Sherin Khankan in 2011. I wish I had because I desperately needed a Danish Muslim feminist in my video and I couldn’t find one. This wouldn’t happen today since Denmark has its own women’s mosque and a roster of women imams of which Ms. Khankan was the very first but is now one of several. The Mariam Mosque was established in 2016 with a small Board of Directors that included men. The physical space is on Købmagergade, an apartment in central Copenhagen, generously donated by the well-known Danish photojournalist, Jacob Holt. The Mariam Mosque was not the first of its kind in Europe, but almost. In Denmark, it was a revolutionary achievement. Having heard that, one might expect to see a film about public recognition of achievement, but not so. Skovgaard’s film is tightly framed and not so much about Sherin as what Sherin does for other women in the name of Islam. In this way, The Reformist is a very Danish film because Danes do not generally like “celebrities.” Culturally speaking, Danes are suspicious of people whom the media elevate to star status and it would have been easy to do this with Sherin Khankan because - outside Denmark – she is a celebrity. Khankan was named one of the BBC’s 100 Women 2016. 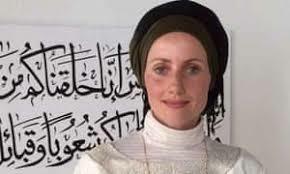 She is the author of several books on Islam in Europe and in 2017 she published La Femme est l’avenir de l’Islam – Le combat d’une Imame en France. In March 2018, Khankan met Emmanuel Macron to discuss “a dialogue of civilizations.” President Macron believes Khankan’s “Islamic feminism” can forge a progressive middle way between French laïcité – secularism – and alienated conservative Muslims. “I took him my book as a gift,” Khankan says, “but he said, ‘I’ve already read it.’ ” In June 2018, Time Magazine asked Sherin no less than if she was the future of Islam. Khankan was born in Denmark from a Syrian father and a Finnish mother in 1974. She sees herself as being born between two worlds – east and west - and considers her life’s goal to reconcile these opposites. "I had a feeling early on that it was my job in life to reconcile contradictions,” she says. Born Ann Christine, Khankan was raised in both religious traditions while enjoying a somewhat normal childhood in Scandinavia. As a teenager, she visited Damascus for the first time and found herself attracted to her Syrian heritage and family. She encountered Sufism, learned Arabic, and stayed to study. At 19, she shed Ann Christine for her Muslim name. She returned to Denmark in 2000. She stood for parliament as a candidate for the Danish Social Liberal Party in 2002 but was publicly renounced when she refused to denounce Shari'a Law. She holds a Masters in Sociology of Religion and Philosophy from the University of Copenhagen. Khankan founded an organization called Critical Muslims who were interested in the link between religion and politics. In 2007, she published a book titled Islam and Reconciliation - A Public Matter . She is the mother of two sons and two daughters and recently divorced from her husband who made her choose between the mosque or the marriage. Thus, Sherin Khankan has a dramatic and colorful personal history. She is indisputably an extraordinary person whose life story would make a great biopic, but very little of it is in The Reformist . It is to Marie Skovgaard’s credit that she wanted to show what goes on inside the mosque and what this means. The Reformist is not a portrait of Sherin Khankan but rather, instances and illustrations of what Sherin does for other women. What the viewer gets is a powerful message about Islamic spiritual care. After a civil divorce, many Muslim women crave an Islamic ruling to quiet their hearts. Khankan grants them Islamic divorces when no other imam will and by doing so, gives them protection from violent husbands. Khankan, who is also a trained therapist, has extensive experience in offering Islamic spiritual care since she is a founder of an NGO called The Exit Circle , (www.exitcirklen.dk) standing up for women who are subjects of psychological violence and social control. Today, she is the CEO and responsible for 40 volunteer workers and seven self-help groups in Denmark combating mental abuse. Khankan officiates at weddings when a Muslim woman wants to marry a non-Muslim man. Her first couple was Swedish, a Christian man and a Muslim woman of Pakistani origin, who wished to honor each other’s religion but not convert. Until they met Khankan, 96 imams throughout Europe had turned them down. salat by chanting the traditional adhan. She sees herself as a khatibah, a speaker, the one who gives the khutbah , what non-Muslims know as the sermon. The Reformist is how Sherin ended up alone – and doing it all - after assuming too much. She failed to behave like a team player. She gave into her impatience by moving too fast. She burned bridges when she wanted to build them. By the time the film ends, however, she has managed to recruit other women imams and to regain a balance. I believe that Marie Skovgaard’s film is actually a work in progress and that what she gave us in chapters 1 through 3 is just an introduction. I believe the Mariam Mosque has chapters 4, 5 and maybe 6 in front of it and I hope Skovgaard will take us with her as she observes and records. ulama who wanted to establish and ultimately validate patriarchy. In fact, one of Muhammad’s wives led prayers. In addition, as some Muslim feminists point out, Muhammad was one of history’s first feminists because he outlawed female infanticide at a time when it was a popular practice in desert societies. Muhammad also gave women the right to divorce and to keep their dowry. And most surprisingly, he gave women the right to inherit property. Sherin Khankan's "reforms" are related more to the old men who took away these rights than they are to the Islam that The Prophet originally formulated in his original teachings. Divorce was removed by muftis. Khankan’s first divorce as an imam concerned a woman whose husband beat her and her children so violently he was imprisoned for seven years. My last takeaway from Marie Skovgaard’s film is about spiritual maturity. Most Muslims who live in western cultures are either traditional or secular, the latter erroneously implying a renouncement of their faith. I don’t know for sure but I’m guessing that Sherin would take issue with Danish westerners who think it is contradictory to call oneself a progressive Muslim. “If you were a true progressive,” some say, “you’d declare yourself an atheist and give up religion altogether.” The Mariam Mosque gives women a safe place to exercise their spiritual lives without apology or explanation. It also gives modern Muslims an opportunity to believe in a separation of church and state. Muslims in democratic societies are protected from imposed piety and an imposed particular school of Islam. Muslims in secular democracies know their right to choose - whatever they want to believe in - is protected by secular law.